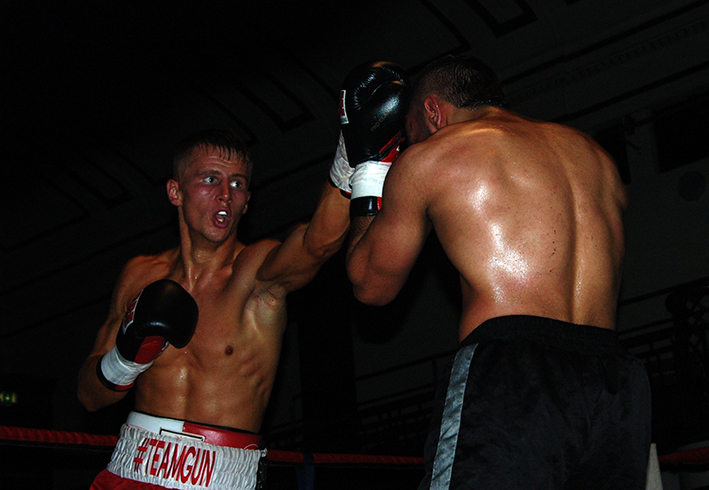 Sensational Teen Prospect Tommy Martin Back In Action Nov 29th. Back on October 18th St Neots teen sensation Tommy ‘Da Gun’ Martin put in a scintillating performance, to take the laurels against Ibrar Riyaz at York Hall, to make it five wins on five outings in the twelve months since he turned professional. Throughout the bout Tommy dominated and controlled the proceedings with some seriously classy ring craft, which enabled the nineteen year old to pick off the highly experienced Riyaz virtually at will, to secure a superb 40-37 points victory. After such a tough fight and with the mid season break heading up fast, most young fighters would be thinking of winding down for the Christmas break, not young Tommy, who already has another fight lined up. On November 29th Tommy makes his sixth pro outing, against a yet to be named opponent, on former WBU Lightweight World Champion Graham Earl, in association with TRAD TKO Events, latest offering ‘Stevenage Fight Night’ at the Stevenage Arts & Leisure Centre. Following a training session, under the watchful eyes of coach Barry Smith at the TRAD TKO Gym in Canning Town, Tommy spoke of his upcoming November outing. “I can’t wait and hopefully I’ll get my sixth win. We’re fighting in Stevenage, four weeks after my last fight, but I’m young fit and healthy, so I’m more than ready to go. It’s all about making sure I’m sharp, I’m sure Barry Smith will make sure I’m in top shape. I’ve been coming to the TRAD TKO for coming up to a year now, I’m learning every time in the gym, Barry’s always on my back, he’s always there, if I do something wrong he corrects it. I’m in a really good place at the minute. Firstly I’d like to thank TKO for being there for me, secondly I’d like to thank my main sponsor, Junction 17 Cars, who have just given me a car for winning my last fight. They’re covering all the financial side, so I can just focus on the boxing. I think that’s why I am improving all the time. I’m living the life, Monday to Friday on my own and focusing on boxing, my Dad is covering all the tickets, with my cousin JJ and Sheridan. Yeah, I’m more than happy with the way everything is going, more than happy. Tommy ‘Da Gun’ Martin, against a yet to be named opponent, features on the Graham Earl, in association with TRAD TKO Events, ‘Stevenage Fight Night’ at the Stevenage Arts & Leisure Centre on Friday 29th November.